Wendy has another adventure! 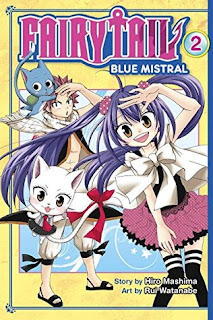 As the Fairy Tail gang are on a train going home Wendy finds the window smashed open, everyone asleep and herself and Carla sucked out while going over a bridge. They end up in a walled garden with no exit. When they enter the spooky house they find a boy who keeps appearing and disappearing and tells them of the monster.Then Wendy meets the monster! A cute story. I liked it a lot until the ending which was a bit contrived trying to make good guys out of everybody. But Wendy and Carla were as cute as ever and their fans will enjoy the volume. A sneak peek at the next volume looks like it should be a good one!